Alaid, Kuril Islands (Russia) | Gamalama, Halmahera | Kliuchevskoi, Central Kamchatka (Russia) | Paluweh, Lesser Sunda Islands (Indonesia) | Sangeang Api, Lesser Sunda Islands (Indonesia). Etna, Sicily (Italy) | Fuego, Guatemala | Galeras, Colombia | Karymsky, Eastern Kamchatka (Russia) | Kilauea, Hawaii (USA) | Manam, Northeast of New Guinea (SW Pacific) | Popocatépetl, México | Sakura-jima, Kyushu | Santa María, Guatemala | Shiveluch, Central Kamchatka (Russia) | Tongariro, North Island (New Zealand). El Hierro volcano off the Canary Islands has experienced a new swarm of small quakes (10 so far) which started this morning under the centre of the island. The earthquakes are located at about 10 km depth. East Nusa Tenggara Volcano in Idonesia erupts. Hundreds of villagers near Mount Rokatenda on Palue Island in Sikka, East Nusa Tenggara, have been evacuated. 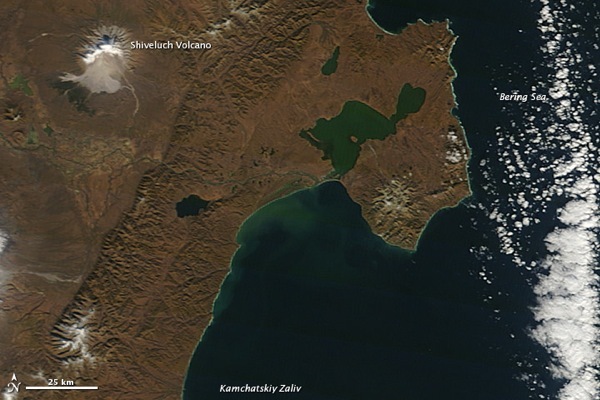 When NASA’s Terra satellite passed over Russia’s Kamchatka Peninsula at noon local time (00:00 Universal Time) on October 6, 2012, Shilveluch Volcano was quiet (top image). 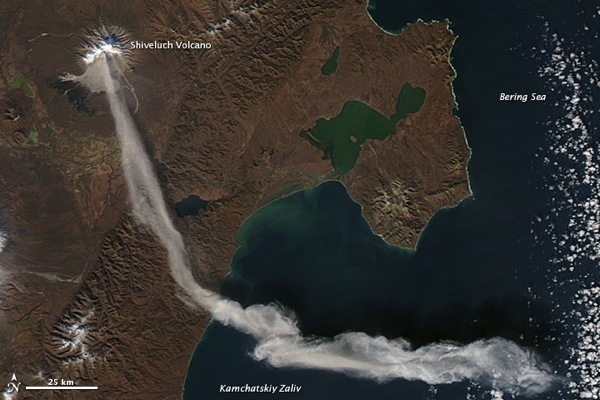 By the time NASA’s Aqua satellite passed over the area two hours later (bottom image), the volcano had erupted and sent a plume of ash over the Kamchatskiy Zaliv. Mount Lokon in North Sulawesi province erupted on Sunday afternoon as heavy rain fell around its cloud-covered crater. The sound was heard 5 kilometers away but the height of the eruption was not visible. The volcano spewed smoke and ash and caused muddy rain to fall in nearby villages. 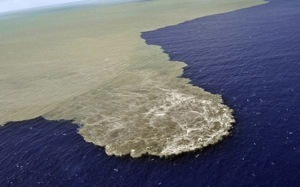 A new earthquake swarm has started yesterday at the El Hierro undersea volcano off the Canary Islands. The number of quakes rose from an average of about 8-10 to 23 quakes. Most of them are weak and located at around 10 km depth in the western El Golfo area. Five active volcanoes in Indonesia are rumbling due to increased geophysical activity linked to recent earthquakes in the nearby Philippines. Mounts Soputan, Lokon and Karangetang are active in North Sulawesi province, while Mount Gamalama is showing signs of unrest on Ternate Island and Mount Marapi rumbles on Sumatra. All five volcanoes produced explosions within a week’s time that sent ash plumes soaring above the summits. The overnight blast from Mount Soputan was heard by residents nearly 30 miles away. Mexico’s Popocatepetl Volcano has registered at least 26 eruptions accompanied by steam and gas, as well as a volcano tectonic quake. Mount Marapi volcano has erupted on Indonesia’s Sumatra island, spewing thick grey smoke up to 1.5 kilometres into the sky. Kizimen volcano (Eastern Kamchatka (Russia)) activity update: active lava flow, occasional pyroclastic flows and/or explosions, ash plume to 11 800 ft.
Lokbatan mud volcano in Azerbaijan erupted Thursday morning. The flow of mud has since weakened and no flame was observed. Last time the volcano erupted was in 2010. Fuego volcano, Guatemala has increased its activity again. Strong strombolian explosions generated ash plumes rising up to 1 km and ejected blocks up to 200 m above the rim. Incandescent material rolled down the flanks for 500-1000 m and shock waves accompanied the explosions. Mount Merapi volcano in Indonesia also shows increased activity emitting ash and smoke. An overview of new Activity/Unrest globally: Fuego, Guatemala | Gamalama, Halmahera | Grozny Group, Iturup Island | Little Sitkin, Aleutian Islands | Lokon-Empung, Sulawesi | San Cristóbal, Nicaragua | Soputan, Sulawesi. Ongoing Activity has been reported at: Batu Tara, Komba Island (Indonesia) | Karymsky, Eastern Kamchatka (Russia) | Kilauea, Hawaii (USA) | Popocatépetl, México | Sakura-jima, Kyushu | Shiveluch, Central Kamchatka (Russia) | Telica, Nicaragua. A third Indonesian volcano erupts. Soputan volcano in North Sulawesi has had a new explosive eruption which produced lava fountains of several hundred meters height and an ash plume rising to 30,000 ft [10 km]. Another new explosion occurred at Shiveluch volcano in Kamchatka, Russia. Indonesia’s Mount Gamalama volcano Molucca Islands unleashed two strong eruptions over the weekend, sending volcanic ash as high as 1 kilometer, showering nearby Ternate with ash. It has been reported that another Indonesian volcano, Mt Lokon has erupted, sending ash plumes up to 1,500-meters. Offshore volcanic activity on Spain’s El Hierro island has resumed far below the Earth’s surface in a similar manner to last July, but on a somewhat stronger scale.